DLF’s Ryan McDowell examines some of the more complex RB situations in the AFC. I’m a list guy. I make “to do” lists, follow “honey do” lists, and will take time to read a top ten list of almost anything. 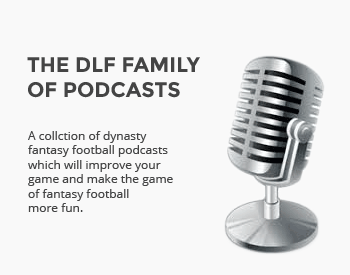 This series of articles will bring you a top five ranking about a myriad of topics in the world of dynasty football. As we inch closer to the beginning of training camps, dynasty owners continue to focus on building competitive teams and that means we begin to cure our collective case of rookie fever and turn our attention to players who can help us win now. While the running back position has been an afterthought for years, the emergence of the “Big Three” along with multiple consecutive highly drafted backs, namely Todd Gurley, Ezekiel Elliott and Leonard Fournette, has given the overall position the relevance it deserves. Not all backfields are as crystal clear as the Rams, Cowboys and Jaguars though with many teams employing a running back by committee or simply just having a lot of competition for touches. Here is my look at some AFC teams with crowded backfields and how dynasty owners should be valuing the players involved here. Nice article. A lot of intriguing buy-lows. I’m currently targeting Ware. I have Miller, Martin and then Powell as my RBs so I’m looking for an RB2/Flex play. I offered Godwin and a 2018 2nd. He likes Godwin, as do I. But if Ware can get the bulk of the carries, it could really pay off. Thoughts on the offer? Thanks. I like Ware as a buy low, but I actually think Godwin/2nd is a little more than I’d pay. If you can get Ware for a 2 and Godwin take it and run, he will loose some passing downs to Hunt but I think he is still lead back there. In Denver with Booker out for the preseason and Henderson getting some good early press, do you see Henderson sneaking in and grabbing the backup job? Anderson and Charles are both backs I don’t trust to make it through the season, so the top back up on that chart is one I’ve been trying to gauge. I think there’s a chance and I added him in a few leagues. They seemed really disappointed by Booker last year anyway, so this only makes it worse. If Charles has anything left or Henderson steps up, Booker might not get much run this year.